"On this Valentine’s Day, as many as 4.4 million more Americans than on Feb. 14 last year could go to the doctor to get the news. 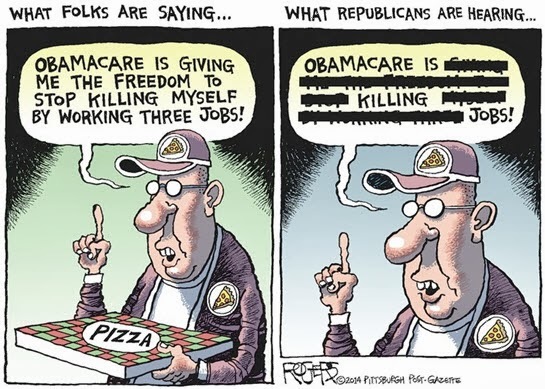 "That’s because the Affordable Care Act provided them with health insurance. So they can afford to have a physician diagnose their light headedness or aching hearts. "The Republican response to that good news, as in the song made famous by Robert Palmer, is 'WHOOAAA.' 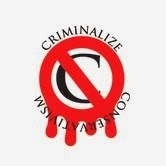 They want to stop it. They want to reverse, revoke, rescind, retract the Affordable Care Act. They’ve tried it all. Nearly 50 times they voted to repeal the law that so far has given as many as 4.4 million more Americans health insurance in the past year and that will, over the next month or so, add a million more to that number. 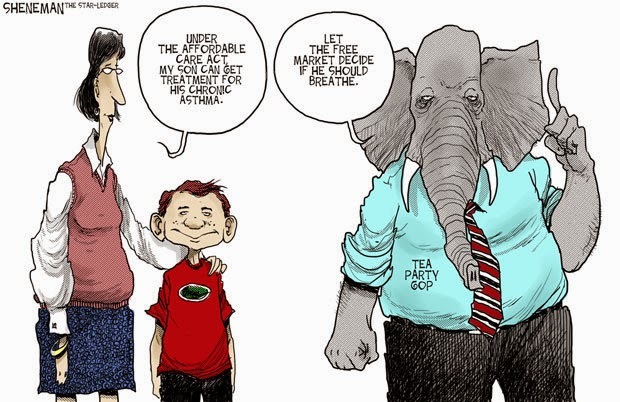 No pill’s gonna cure Republicans' ill. They got a bad case of hating Barack Obama. So bad that they’re intent on taking health insurance from millions of Americans in an attempt to wound the President. "So far, Republicans have failed to repeal the Affordable Care Act. 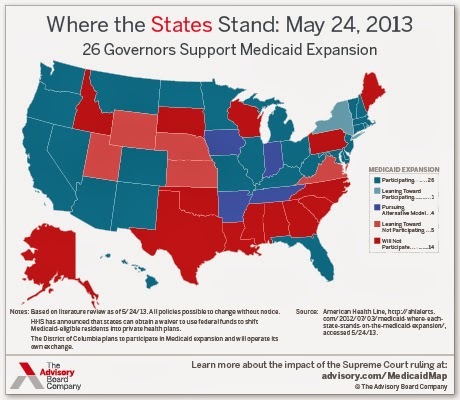 But 21 GOP-controlled states rejected the Act’s provision extending Medicaid to additional low-income people. They’ve refused to expand Medicaid coverage, even though this will cost their states tens of billions in federal aid and will cost untold numbers of their citizens their lives. "The case of Israel Hilton is an example of the high price of hate. Hilton, 49, worked his whole life in customer service, a job he did well enough to earn an employee of the year award from K-Mart. But his employers didn’t provide health insurance. He earned too little to buy it himself and too much to qualify for Medicaid in his home state of Texas. "Under the Affordable Care Act, Texas could extend Medicaid to cover the working poor like Hilton. The federal government would pay 100 percent of the cost for three years. After that, the feds would cover 90 percent. More than 1.5 million Texans would get health insurance. They could see doctors when they were ill. In addition, Texas taxpayers and premium payers would not subsidize so many costly emergency room visits by the uninsured. "But Texas Republicans refused the federal money. And so, in Texas, there will be more stories like Israel Hilton’s. Last year, he suffered severe headaches and seizures. He went to an emergency room, a place that by federal law could not turn him away despite his lack of insurance. It’s not a place, however, most appropriate for determining the cause of seizures, and he was misdiagnosed. Without health insurance, he didn’t seek a second opinion. By the time he returned to the hospital and received the correct diagnosis of brain cancer, it was terminal. "A study released last month shows what each state will lose in federal funding by rejecting the Medicaid expansion. Texas will forgo the most, according to the researchers at the Wagner Graduate School of Public Service at New York University, about $9.2 billion in 2022. "No state that refused to expand Medicaid will save money, the researchers found. In addition, the study noted, residents of states like Texas will subsidize with their federal tax dollars the services provided in other states and denied in Texas. Earlier research showed the loss to Texas over a decade at $100 billion. "That’s a bad case of hatin’ Barack Obama. 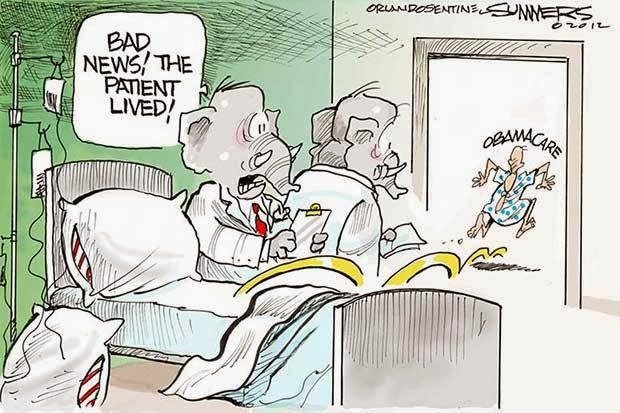 "And the prognosis for the Affordable Care Act is good – which, of course, is bad news for the GOP. Despite the bumpy Obamacare website roll out, it’s working now, and last month nearly 1.14 million people signed up for insurance through the exchanges, a number higher than projected. The so-called young invincibles, aged 18 to 35, bought insurance on the exchanges at a faster rate in January, so now it’s projected their participation will be high enough to keep rates from rising precipitously. 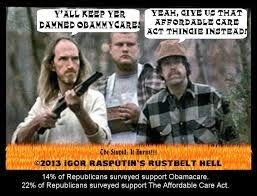 And, the Gallop Poll found the percentage of Americans without insurance last month was the lowest in five years. "Altogether, 3.3 million people bought private insurance on the state and federal exchanges from the time the enrollment period began Oct. 1 through Feb. 1. And more than 6.3 million people signed up for Medicaid just between October and December. Some of those people would have qualified for Medicaid without the Affordable Care Act, and the total number added as a result of the Medicaid expansion won’t be known until after the enrollment period ends March 31. But it’s estimated that at least 1.1 million were added through Medicaid expansion. "It’s not perfect. The Congressional Budget Office now projects that 6 million people will sign up for coverage. That's 1 million fewer than originally projected. "Republicans tried earlier this month to create some bad news from a Congressional Budget Office report that said the Affordable Care Act will enable 2.5 million Americans to leave the workforce by 2024. That doesn’t mean jobs will be lost. Instead, the Affordable Care Act gives workers the freedom to retire early or work part-time because they can buy insurance on the exchanges. Fewer will be forced by the need for health insurance coverage to work full-time at jobs they hate or can barely perform because of chronic illness or would like to leave to care for children. "The GOP failed to persuade Americans that gaining more control of their lives is somehow a negative result of the Affordable Care Act. "What the GOP doesn’t understand is that its effort to deny millions of Americans access to doctors is turning red hearts to blue." "The high price of hate," we can only hope, is booting the Conservatives out of public office and out of our lives as people wonder at the Cons turning the red eyes of the sick and dying to blue. The 2014 election should be a cakewalk for Democrats if they can explain to voters how Conservatism means misery, illness, and death for the People -- and then get out the vote. It's either criminality, stupidity, nastiness, or insanity that drives the Conservatives - and we pick two of the four choices: criminality and hate.